It's gotta be tough to be the one guy that everyone is depending on to save them from... well... basically everything. We've got Heartless, Nobodies, Organization XIII. There's Xehanort, Xemnas, Amsen... who are all kinda the same guy, actually. But, hey, let's just add body-hopping immortal baddy to the list, why don't we? And, what are the other warriors of light offering up to help poor Sora along his way on his destiny? A new changes of clothes!? Sure, they're "magic clothes," they claim. But, what does that even mean? How are fancy new magic clothes supposed to help him conquer an endless stream of creatures and villains from the Darkness!? Well, admittedly, they do look pretty awesome. And, the choice to accessorize with all sorts of extra belts and straps? That's pretty edgy. Almost as edgy as Sora's hair, in fact. Come to think of it, those magic clothes... we're pretty impressed. 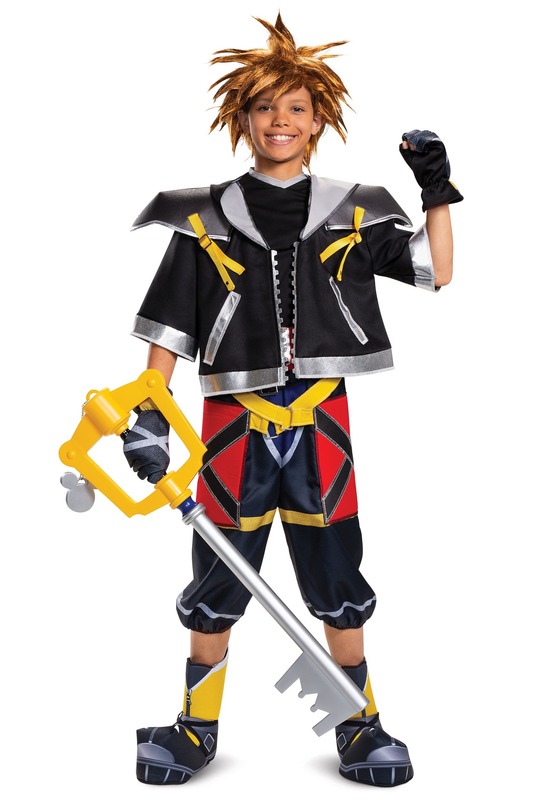 That's why we're going to pull a Master Yen Sid and bestow upon you this Deluxe Sora Costume from Kingdom Hearts II. This outfit is designed to look just like our more experienced hero as he sets off to learn about the mysteries of the Nobodies and stop Organization XIII from their nasty plans. We've got a black jacket with wide shoulder pauldrons. You'll love the long shorts with printed designs to look like the large red flaps. And, belts? We know you asked for belts. So, trust us, you'll have plenty of Sora's iconic belts and straps throughout the look! IT'S ALL ABOUT THE BELTS!